There are so many great activities you can do in your lessons in the lead up to Christmas. Here at ESL KidStuff we have a lot of Christmas games & activities, Christmas themed flashcards and worksheets as well as craft sheets. 1. Christmas cards. You can easily make these in class with some construction paper and common craft supplies. Before class, cut out enough card for each student. 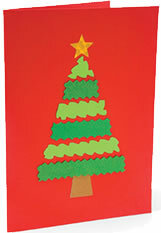 Then have students draw, paint or use felt to make a Christmas scene on the card (Santa, holly, a Christmas Tree , etc.). 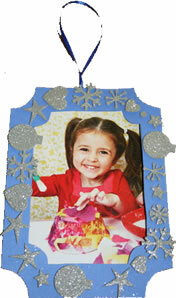 Students can then decorate the cards with glitter, cotton wool for snow, shiny stickers, etc. Older kids can write a Christmas message inside the card and for smaller kids you can help them write their own message (even get them to trace over a message written lightly in pencil). A nice idea is to have each student give their card to another student (in an envelope if you can stretch your budget far enough!). 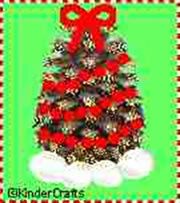 We have some Christmas Card templates in our Crafts section. 2. Pine cone Christmas Tree. In many parts of the world there are pine cones all over the place at this time of year and they can be used for making great mini-Christmas Trees. All you need is pine cones, glitter, cotton balls, small beads threaded onto some cotton or dental floss and a star for the top. Then simply follow the steps here. 3. Finger puppets. These are easy to make and look great and you can get the materials from most art & craft stores. 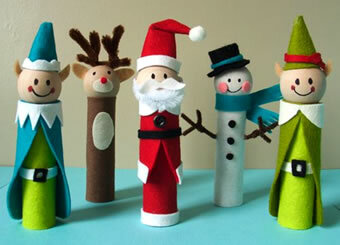 You need some felt which you wrap around rolls made from card (finger size). The heads are made from wooden balls which can be found in art & craft stores and then pipe cleaners and buttons for decoration. 4. 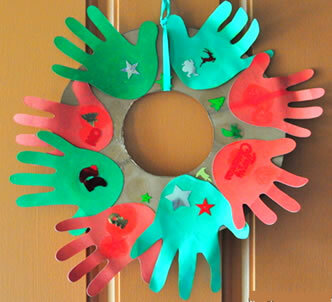 Christmas Wreaths made with hand prints. This one is so easy to do and nice and messy! You need red and green paint in separate trays. Have each student put a red and green print of their hands onto card. When the paint has dried, cut out the hand prints and either glue together in a circle shape or glue onto a ring made from card. 5. 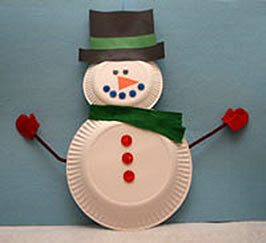 Paper plate snowman. Just glue 2 white paper plates together (slightly overlapping) to form the body and then use felt or colored paper to decorate. You can use pipe cleaners for the arms. 6. Santa’s hat craft. 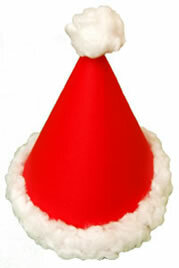 Use red construction paper to make a cone shape and then decorate with cotton wool. 7. 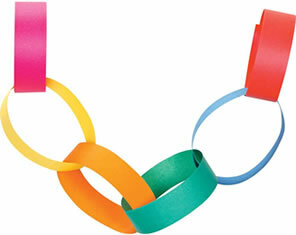 Paper chain decorations. Decorate your classroom with this easy craft. Good for any age, especially little ones as you can teach / practice colors. 8. Christmas stocking craft. Just cut a stocking shape out of construction paper, then use felt, ribbons and fur trim to construct the stocking. Cotton wool is a good substitute for the fur. 9.Picture Frame Ornament. Here is a nice craft which could double as a Christmas present your students can make for their parents or grandparents. 10. Reindeer hat with hand antlers. This is nice and easy and great fun. You’ll need a lot of brown construction paper or card. First, have your kids draw an outline of their hands on the construction paper and then cut them out. Get some strips of the construction paper (cut out before the class) and fit to each kids head (best done by you or another adult) – fasten with staples (not whilst still on the child’s head!!). Finally, have the kids draw the reindeer face on their hat and stick on the antler hands using popsicles to keep them in place. 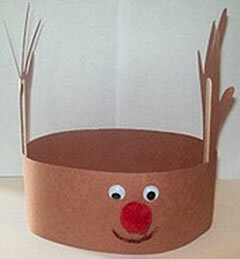 If you are teaching the song “Rudolph the Red Nose Reindeer”, this is great to wear as you all sing along!